The Dell Mini DisplayPort to VGA Adapter lets you view video content from any desktop or laptop with Mini DisplayPort video output on a variety of VGA-compliant displays. Compliant with DisplayPort specifications version 1.1a and supporting a maximum resolution of 1920 x 1200 pixels, this versatile adapter ensures a quality viewing experience on everything from monitors to projectors. This adapter allows you to take video content from your desktop or laptop and display it on any monitor, projector or HDTV featuring VGA input. As long as your device is equipped with a mini DisplayPort output, this compact adapter ensures seamless conversion. Use it to enjoy movies on a home projector, mirror your desktop for an expanded workstation or show presentations at school or work. 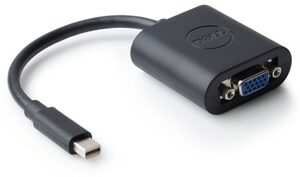 The Dell Mini DisplayPort to VGA Adapter supports resolution of up to 1920 x 1200 pixels to provide crisp, rich video. Measuring 8 x 2 x 1 inch (L x W x H), this plug-and-play adapter is small enough to keep on hand for impromptu presentations for clients or movie nights with friends. The adapter is fitted with a 20-pin Mini DisplayPort on one end and a 15-pin HDI5 VGA on the other, a standard fit for a wide variety of VGA-compatible display monitors, projectors and HDTVs. 1 A valid proof of purchase is required for warranty claims. 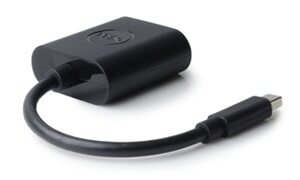 The Mini DisplayPort to VGA adapter from Dell lets you view video content from any desktop or laptop with Mini DisplayPort video output on a variety of VGA-compliant displays. This Mini DisplayPort to VGA adapter supports resolution of up to 1920 x 1200 pixels to provide crisp, rich video. this Plug-and-Play adapter is small enough to keep on hand for impromptu presentations for clients or movie nights with friends. This adapter allows you to take video content from your desktop or laptop and display it on any monitor, projector or HDTV featuring VGA input.